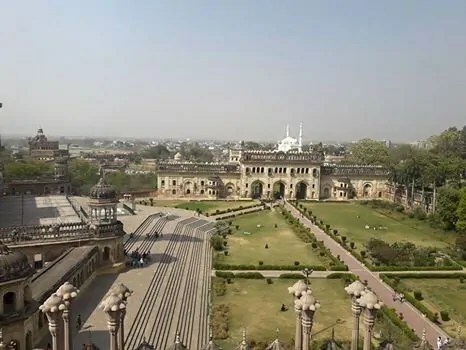 Lucknow is enriched with many buildings of British-era, one of them is Bada Imambada and labyrinth above it. Bada Imambada is a holy place for muslim community built by Nawab Asaf-ud-Daula in 1786-91. Currently it is used by the shia muslims for the purpose of Azadari. A grand tomb, huge lights, chandeliers and multiple tazias are the focal points inside the building. Small steps at left corner leading to labyrinth or “Bhulbhulaiya” on the upper floors is quite unusual and totally steals the show. Said to have more than 1000 passages, all directions look identical and is nearly impossible to differentiate them from each other. Strong pillars and walls are not built only with concrete but with a mixture of pulses and curd. Mixture of these ingredients provide the walls excessive and sheer strength to withstand any natural calamity. Voice of a person speaking from an extreme corner can be precisely heard at another corner. Even if someone whispers behind the wide pillars, that sound is also clearly audible. Architecture was made such way to overhear the conversations. On right side of bada imambada, there is a beautiful mosque. Not open for public, but still you can see it from outside. Opposite to this is a very deep Baoli or step-well, used to store large quantity of water. Whats magnificient in this building is the intelligent architecture. Several angles and points are there on the floor of Baoli, from where entrance is clearly visible but is not visible directly to the person entering. Also, a pit of water shows the reflection of person entering the building. All these features were specific to prevent any illegal encroachments or any intruders by the security personnel. If you are a couple (a man and a woman), then it is compulsory to get a guide and this applies both to the labyrinth and the bowli. Entry fee : Rs. 25.00 (Indian). Rs. 500.00 (Foreigner) (inclusive of Bara Imambara, Chhota Imambara, Picture Gallery, Shahi Hamam). By Air: Nearest airport is Lucknow airport. By Train: Nearest railway station is charbaag railway station of lucknow. By road: Bus or car is also a convenient way to reach lucknow.